The map shows the area of Gravettian at the beginning of the Upper Palaeolithic era. The circles indicate some archaeologically important areas. The Gravettian of Italy is renowned above all for its figurines and burials. Buried people often have archaeologically preserved appliqués, their caps being decorated above all. Exceptionally there were also found some minor body decorations and sometimes imaginative and complicated necklaces, which are unknown to North of Italy. The Alps separated Italy from the colder part of Europe, which influenced the existence and evolution of the Italian Gravettian. The climate here was substantially less harsh than that in more northern parts of Europe. The Gravettian of Italy existed 30,000 – 20,000 years ago and its prominent influence continued here for several successive millenia after that period. A small, stone zoomorphic mask with a third eye in the forehead. The tiny sculpture (several centimetres long) leads us to the sphere of mysticism and mythology, which is unknown and mysterious to us. The unity of polarity of the two bodies. The front view tells us that the first body is obviously a woman, whereas the second one is not a man, but a snake with a parted toothed mouth and apparently slanting eyes on both sides of the head. The belly of the snake bears notches that correspond to long transverse plates characteristic of bellies of the snakes. This apparently mythological motive of a snake and a woman appears in probably all mythologies of the world including Australia and Asia. The Old Testament told about Eve and the snake as well. 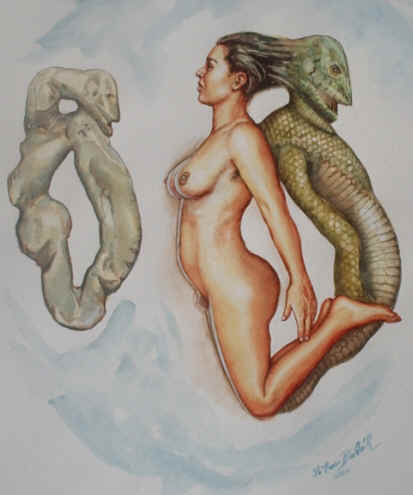 The psychoanalyst Carl Gustav Jung considered the snake one of the common archetypes. Various forms of the unity of polarity were unearthed in other Gravettian archaeological sites of Europe. The boy, buried in a cave, wore a cap with hundreds of shells sewn on it. The objects on his shoulders and his incredibly long stone blade are mysteries to us. The climate of the Italian Gravettian was substantially warmer in comparison with the other Gravettian sites in Europe. There were no mammoths and reindeer. Deer were the main source of furs. A lot of awls found here testify to the fact that clothes were sewn here. The grave found in a “Barma Grande” cave in Italy. 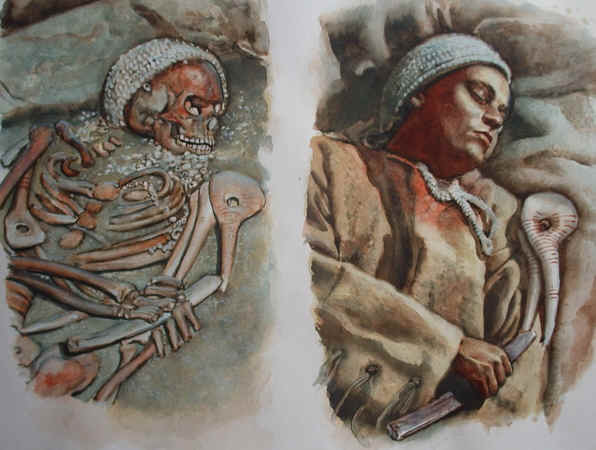 As well as the individuals found at the Sungir site, the buried individuals have many similarities like caps or specific bone-braces on the chest. One individual had a flagrant neck cloth or necklace. Italy didn´t belong exactly to the Northern Gravettian and the people didn´t wear cloths covering the neck, so the jewellery could be seen. The death person lied on a deer skin. The bone- awls were also found on this locality. The Gravettian of western Europe spread from Wales in the British Isles through Belgium to southern France. The term Gravettian comes from one of the archaeological sites in France, and is applied to the cultures that produced - among other objects -small pointed blades with specifically blunt backs. The Gravettian sites and female figurines called Venuses – some of them very famous - have been known since the nineteenth century. Some of the Venuses convey very important information on the fashion of the era, for example the well-known Lady of Brassempouy. 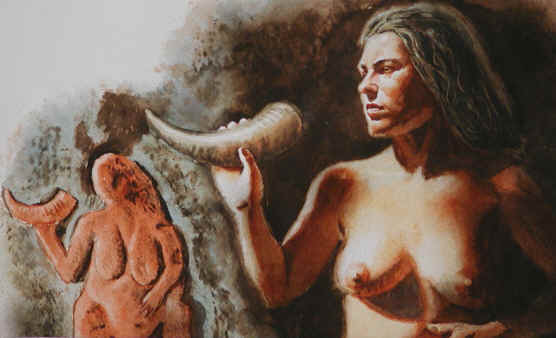 This French Venus involuntarily shows us that it was possible to wear surprisingly long hair in western Europe and that a horn was used for drinking, as it was common during later periods. 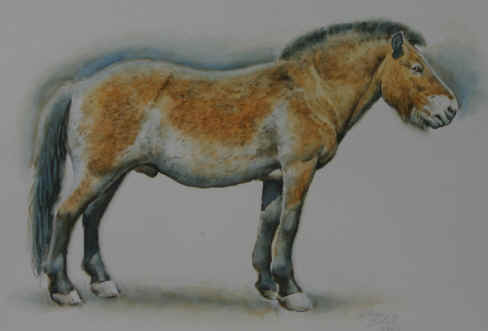 The whole figure was originally covered with red ochre. Another relief shows a segmented headdress, which is a unique matter among the Gravettian material. Generally, the archaeologists do not unearth sculptures that look like those from the films about Indiana Jones or the Treasure Hunters. In most cases, they find just broken fragments of archaic works of art. Even these fragments can surprise you. 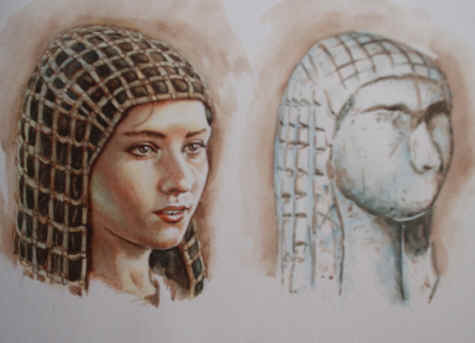 For example, the sculpture on the left reminds of a hairdo of Ancient Egypt or a headgear of old Japan. The fragment on the right with a strange circle under the chest may represent crossed hands or a very thick decorative belt. 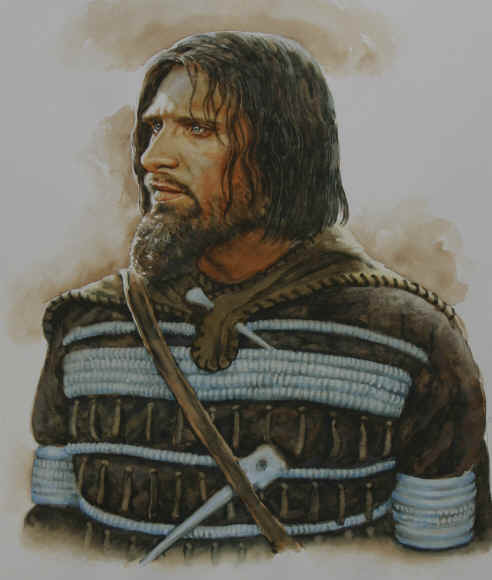 The Gravettian of eastern Europe enjoys a worldwide reputation for an incredibly rich archaeological material including many expressive Venuses that mostly have short hairstyles. Incredibly rich, unique burials are also well-known. The dream of every archaeologist, who is involved in the Gravettian studies, is to discover and explore such a site as Kostenki on the Don River. The Kostenkian, Kostenki-Avdeevo and Kostenki-Streletskaya cultures are the examples of the cultures of the eastern European Gravettian. 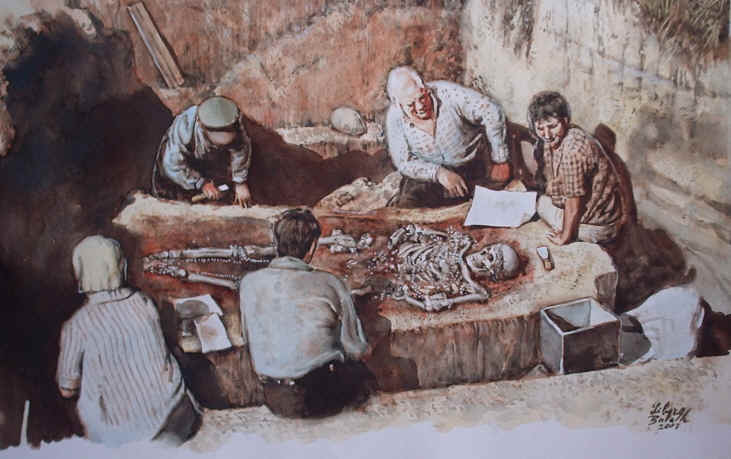 Excavations of the Upper Palaeolithic site by the brook of Sungir, not far from Moscow, yielded a fantastic and unexpected burial, approximately 27,000–23,000 let years old. 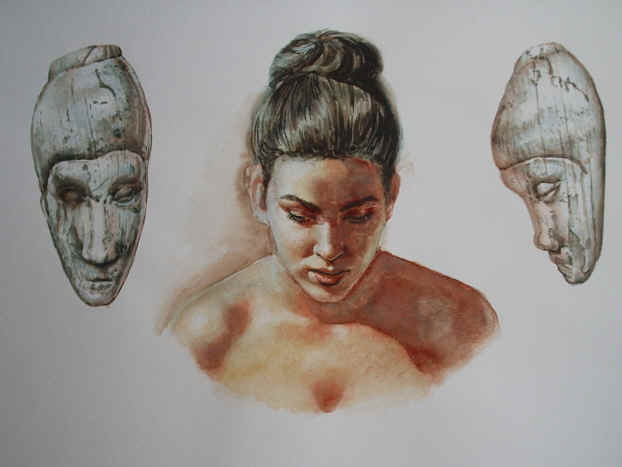 The site is connected with the legendary archaeologist and sculptor M. M. Gerasimov (he devised a methodology of making a portrait according to a skull, which is now used worldwide by criminologists) and the archaeologist, specialist in the Palaeolithic, O. N. Bader. The front page of the original book on the Upper Palaeolithic site of Sungir by O.N.Bader. 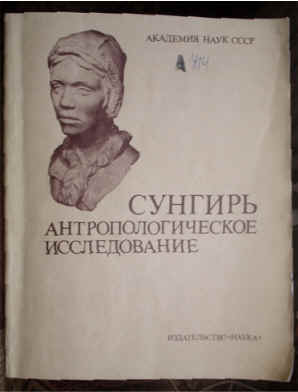 (The title of the publication was Sungir, antropologicheskoe issledovanie). 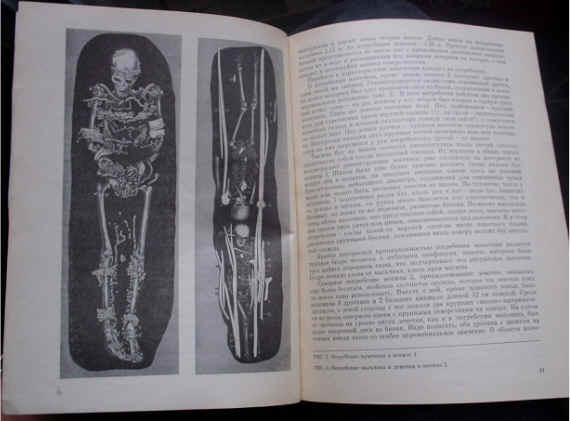 The Russian archaeologists involved in the Gravettian studies also published their unique discoveries in other Russian books. Mikhail Mikhailovich Gerasimov worked out the portrait of the man, and his colleagues made the portraits of the children. They were unicolour, made of gypsum and metal, and that is why they were incomprehensible and unattractive and, as a result, these amazing reconstructions remained unnoticed by both the mass media and the public. 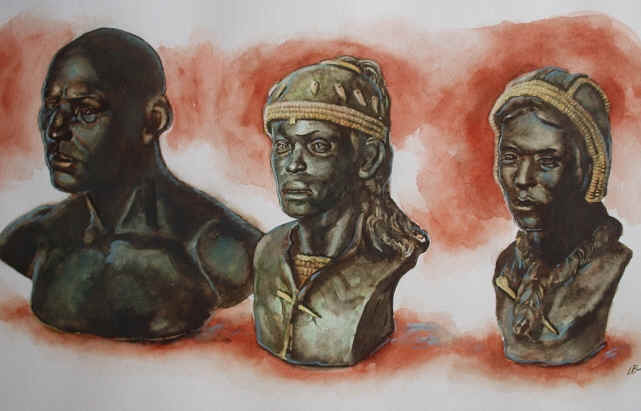 These original Russian reconstructions were modified so as to look lifelike and authentic in order to present them on the Antropark website. 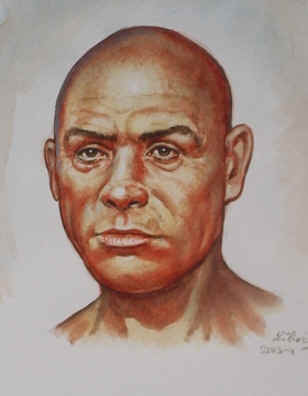 The portrait shows neither hair nor a beard, because these are always very specific and can change the appearance of a man substantially. The man was tall and broad- shouldered. People with a similar appearance can be surely found now in every part of Europe. 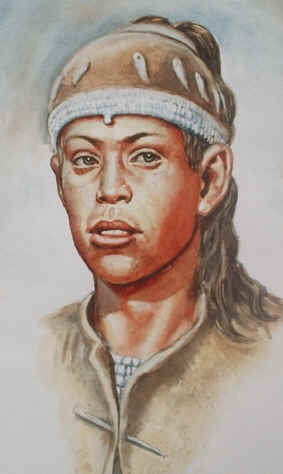 Each of the children had very specific individual features. The boy had a smaller nose and a prominent mouth, the girl had a classically shaped face. 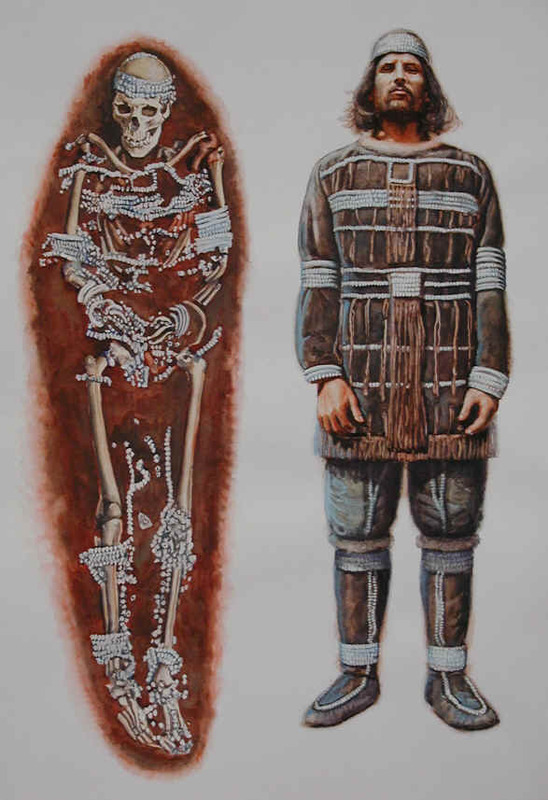 The reconstructional metamorphosis of the unique grave of a man from Sungir into a lifelike ethnographic material - Arctic clothing about 25,000 years old. 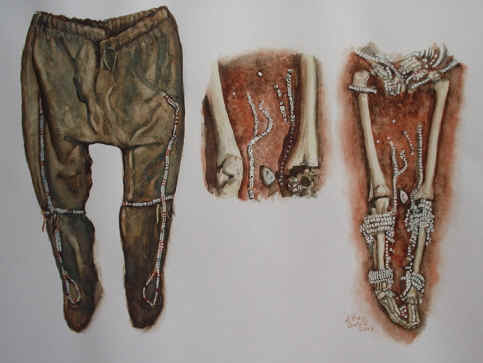 O. N. Bader noticed that the beads on the trousers of the man from Sungir reminded of the trousers worn by the Indians of northwest America (the Indian trousers are depicted on the left). The reconstructional metamorphosis of the burial as it probably looked like during the burial act. The burial is celebrated for thousands of laboriously handmade beads, made of skeletons of Mesozoic cephalopods and an extraordinary rich collection of ivory objects including chemically straightened ivory lances. 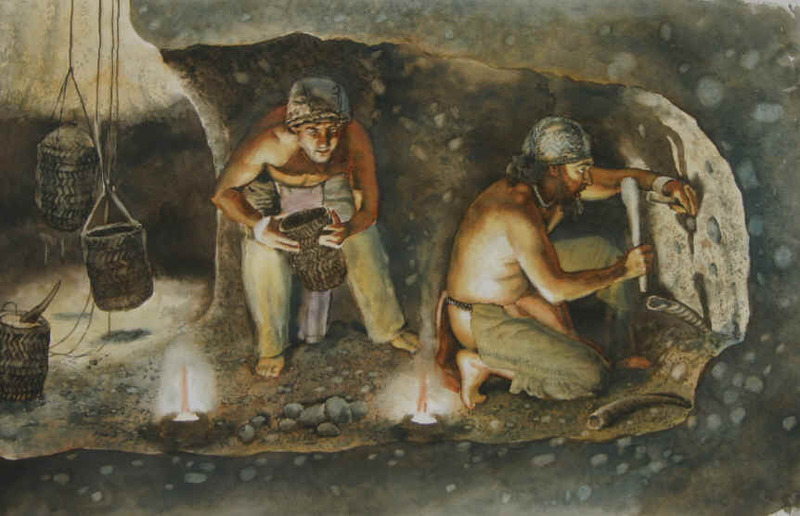 This double burial of the children is also a very illustrative and emotive entrance into the real world about 25,000 years ago and belongs to the most important archaeological discoveries of the twentieth century. In Russia, relatively not far from Sungir, there is another well-known Gravettian site called Gagarino. 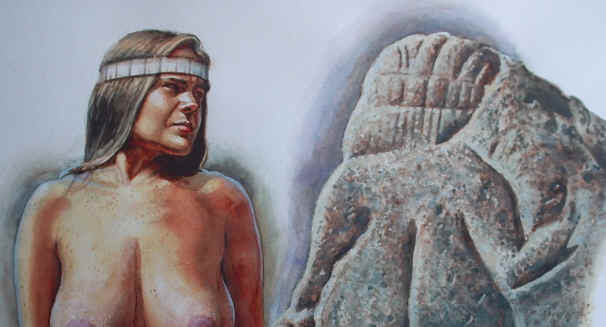 It is interesting that one of the sculptures found there shows a woman/girl and a man/boy in a way similar to that of Sungir. The bodies are united by the heads, but turned to the opposite directions. 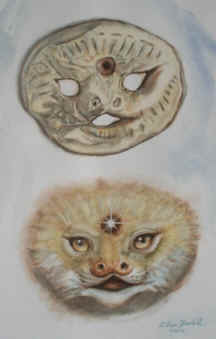 Here we could see again the mystical concept of the unity of polarity. The reconstructional imitation of the production of belemnite beads in a dwelling of the Gravettian people of Sungir. The Sungir site was not interesting just because of the clothes and outfits of the buried people, but also due to the fact that the dwellings of the settlement did not have the usual oval or circular ground plans. The dwellings were rather oblong, and thus they reminded of the large houses of the Indians of the American Northwest or the large log cabins of Siberia. The weapon, which the depicted hunter holds in his hand, was so effective that he could feel himself as a lord of the world during his hunting expeditions. 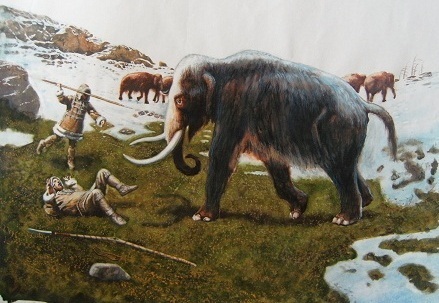 A hunter from Sungir in the festive clothing with a coat, armed with an ivory lance made of an artificially straightened mammoth tusk. 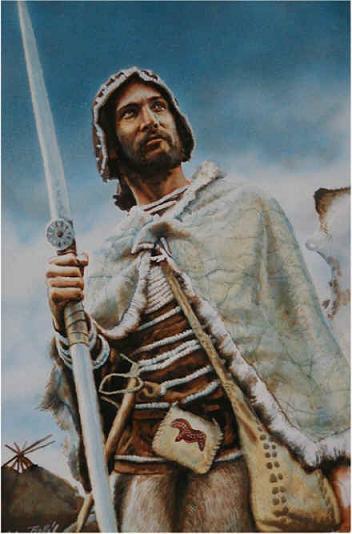 The magical picture “The lord of the world“ painted in 1998 is the most frequently published reconstruction of more than 100 reconstructions created for Antropark. The picture was shown in several programmes of the Czech TV, TV Nova and in the Reflex weekly. It was also used as a poster in the exhibition “The World of Karel Absolon”. 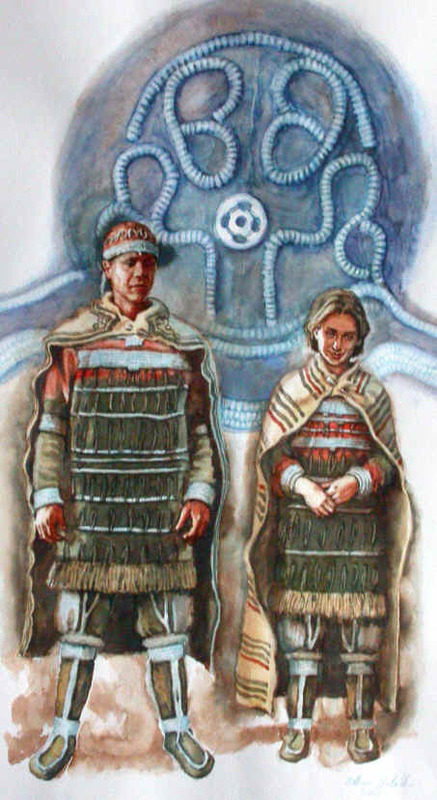 A boy and a girl in clothing resembling the clothing found in the graves in Sungir. 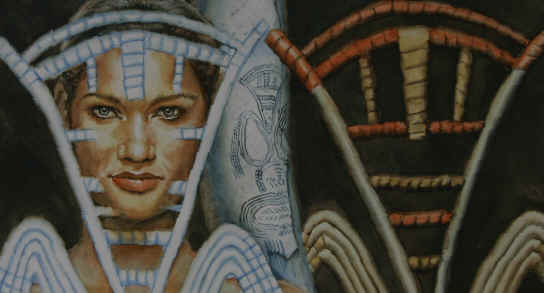 The circle in the background is the bonnet of the girl with belemnite beads. The work shows a very rich cultural pattern of the kostěnkovsko-strelecká culture of the Sungir type. 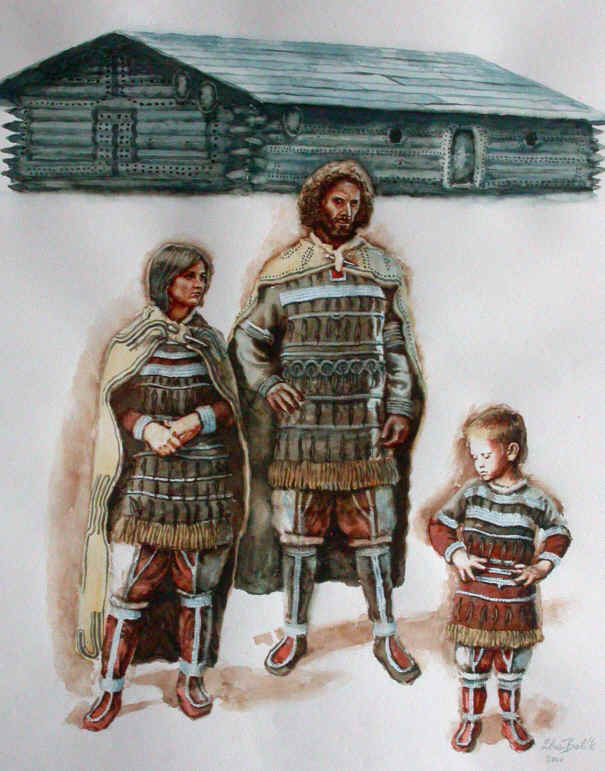 A Sungir family standing in front of a big house. This picture reflects the fact, that not only men, but even women and children were wearing decorated clothes (here are clothes decorated with patterns known from some Sungir artefacts). The dwelling in the background has a size of a dwelling of indigenous peoples of North America and could give a shelter for several families. 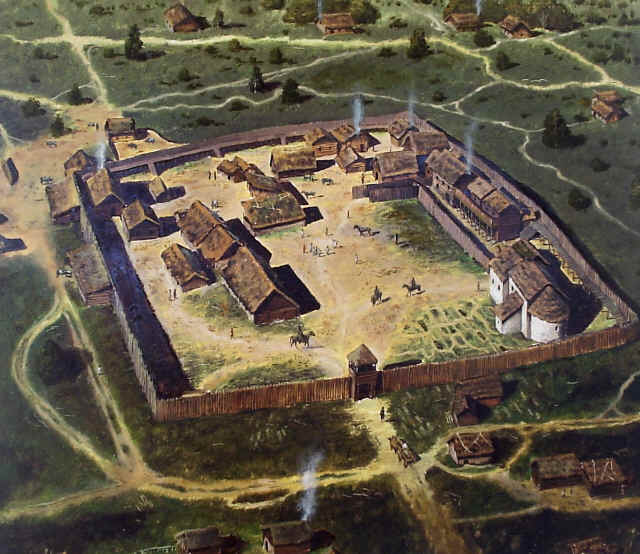 The dwellings had quadratic or rectangular groudfloor shapes, which are known for a long time in Paleolithic (as these in Plateau Parain, France, and other Upper Paleolithic settlements in the USA.) 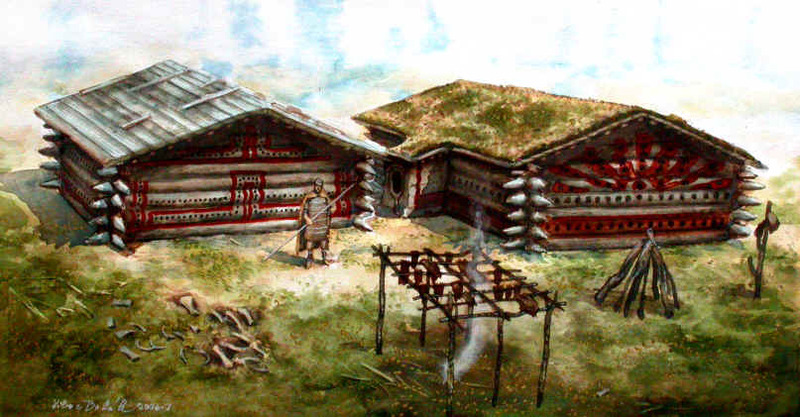 It was not possible to use stakes because of the frozen ground (permafrost), therefore the people built the dwelling out of horizontally laid stocks. In Sungir, the groundfloor of the dwellings were of a rectangular shape and built in pairs. 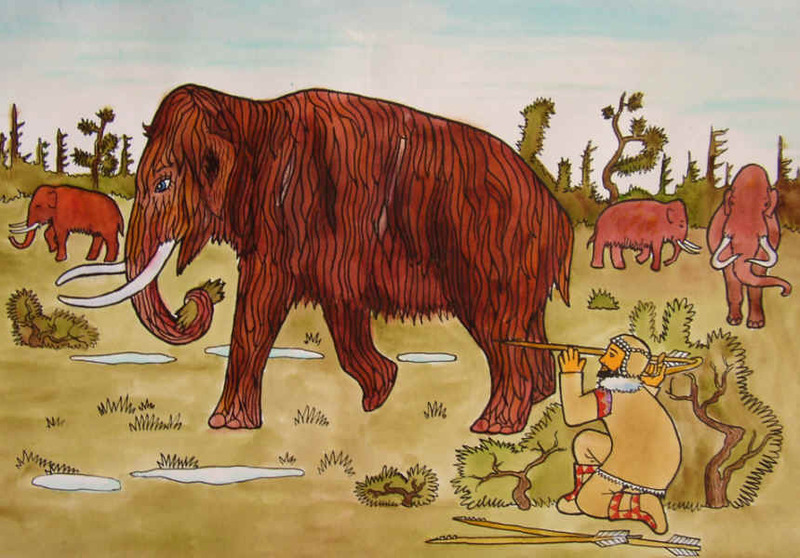 The Upper Paleolithic builders used the qualities of the available materials to achieve the results of massive winter dwellings, that could last a long time. 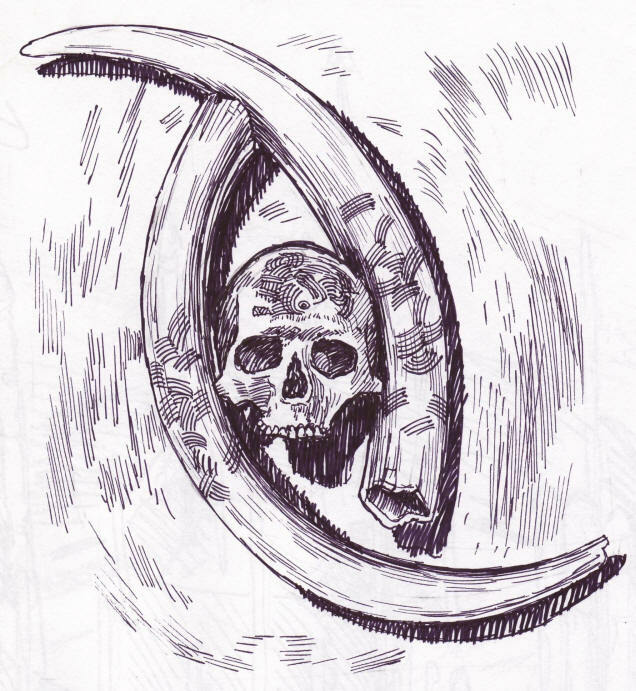 They used the jowls of the mamooths (Meziříčí), mamooths skulls (Mezin), stones with antlers (Malta in Sibirien) and long mamooths bones to build oval or circular dwellings and flat massive timber that could be easy chopped for quadrate buildings. From the ethnography of indigenous people in North America, we know, that the people did not need axes or saws; all they needed was lithic tools, wooden wedges and lump hammers. The solid planks were chopped right from the standing trees. The decoration of the dwellings was representative, as well as the decorative clothing. A tomb with Sungarian children skeletons was discovered in the middle of one of the dwellings; the man was buried later. Than, another human remains were found nearby, probably from older burials. Therefore, this place is considered as a burial- place. Two other dwellings were built probably later and farther from the graves. Kostenki on the Don River is another famous archaeological site. The Gravettian climate there was arctic. 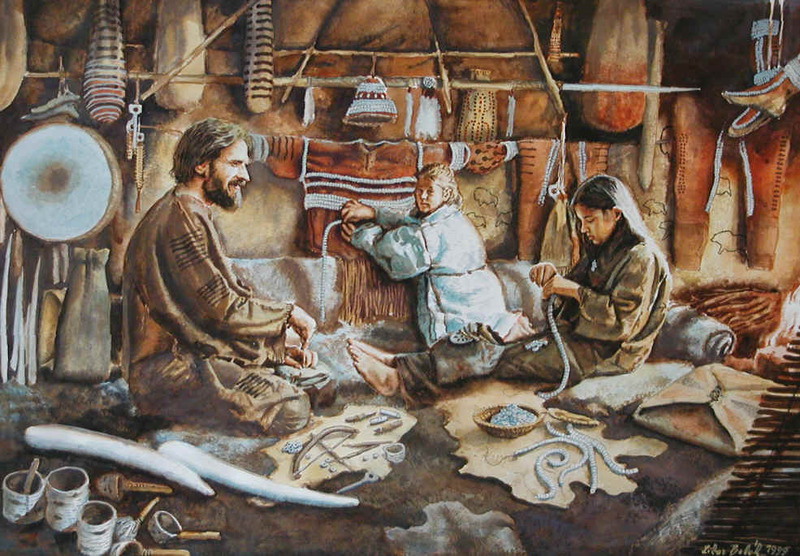 The reconstructional imitation shows us the interior of a dwelling, where there was no need to wear warm clothes. 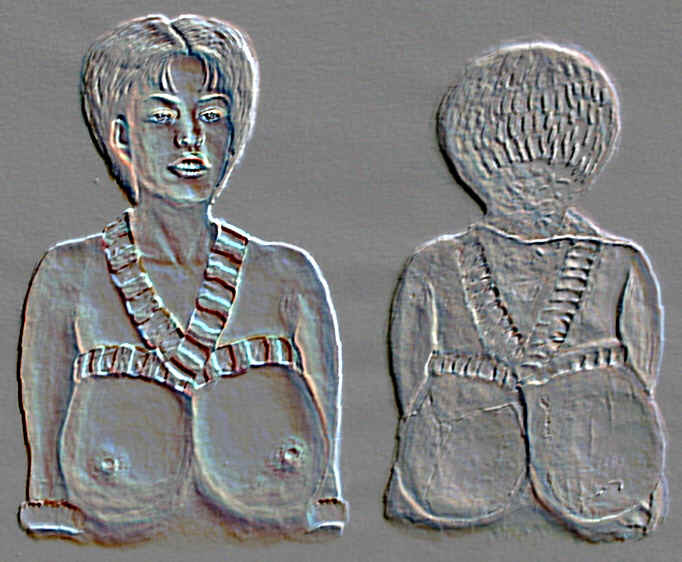 Notice the typical decoration of the chests with diagonal and horizontal stripes, which can be seen in a series of Venus figurines, also characterized by short haircuts. Note also the long shovels with decorated handles behind the kneeling figure. The imaginative handles of the shovels can give us an idea of how the other products of the Gravettian of eastern Europe, for example skies, sledges, carriers for children, bags, cases for tools, weapons and other things could look like. 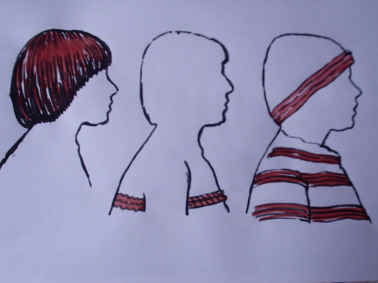 The reconstructional metamorphosis fully respects the hairdo and the horizontal decorative stripes. The Venuses of the Kostenkian culture bear fantastic and unique information on the then decorations. The Gravettian Venuses almost always depicted dignifiedly standing women, and with the exception of cubistically shaped Venuses these figurines were made with much attention, so we can see the decorations and even geometrized decorations. 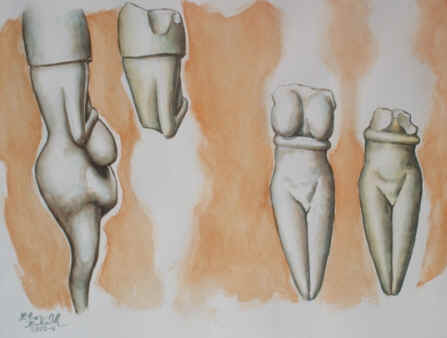 Only the Gravettian Venuses bear information on the ethnographic grooming of female bodies. The statuettes coming from this era are repeatedly carrying signs of ethnographical ornamentation. These two statues show breast belts and bracelets. We can see an excellent workmanship in the small artefacts (spikes with heads, wheels, spike with eyelet) made of hard, durable material (ivory) from the Avdejevo and Sungir sites. These artefacts suggest us of the quality of the objects that did not remain (e.g. boats, oars, sledge, ski, winter boots, bags, baskets, etc.). The Gravettian people were able to soften and straighten the mamooth horn. They manufactured 40 centimeter long projectile points in Moravia and even two meters long spears in Sungur out of them. The quality of the Gravettian products was dictated by the harsh arctic conditions. Everything had to be light, ingenious, well made and, above all, extremely reliable. Nobody surely wanted to lose a glove during a several days long expedition. This would have surely meant a frostbite and loss of several fingers. Unreliable boots or sledges would have certainly meant death. That is why archaeologists find so many proofs of the meticulous work of the Gravettian designers, craftsmen and artists, all these skills often represented probably one and the same person. 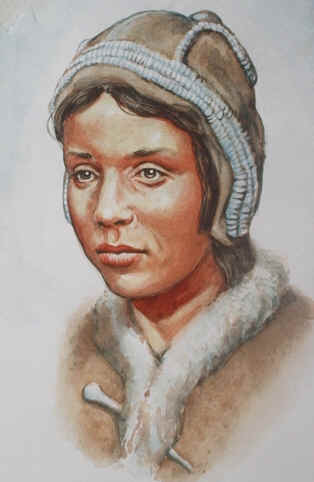 The Gravettian people look like people who were very particular about their appearance to make favourable impression on each other and on foreigners as well. The figurines show us neat hairstyles and imaginative headgears, some of them quite unconventional. We can also see decorative body belts and decorations in figurines and also in burials. Notice also the classical and peaceful woman’s face. 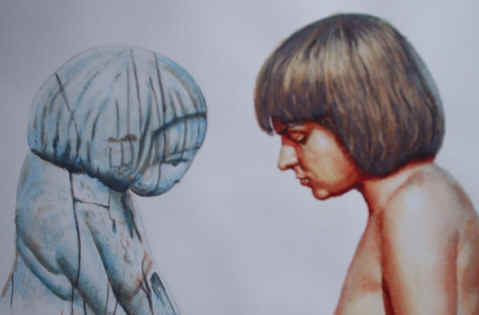 A reconstructional metamorphosis of a typical Kostenki- type cut of eastern Europe, which we can see in many figurines.